Most web browser does not have capability to allow user to change the user-agent string directly without the help of add-on, extension or plug-in, with the notably exception of Apple Safari web browser. User-agent string is transmitted to web server to make known the browser’s application type, operating system, software vendor, or software revision. Internet users may want to alter or change the user-agent string that been submitted to the remote server for various reasons. For example, some web pages or web apps only support and allow specific type of web browsers, specifically IE and Firefox. Some web services have a pay wall where visitors must pay or subscribe in order to view the content, but by faking and spoofing as search engine spider or crawlers, the content is accessible for free. Besides, some websites serve different contents to different type of devices, making changing of user-agent necessary (such as emulate iPhone in Safari desktop browser) to access content pages targeted to specific browser. In Safari, click on Edit on menu bar, and go to Preferences. Tip: If menu bar is hidden, press Alt key to reveal and show the menu bar. 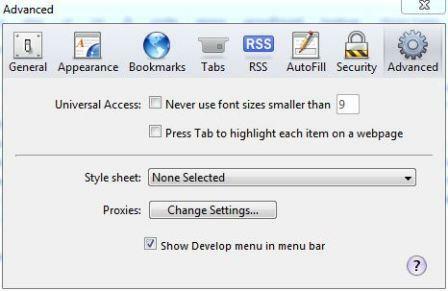 Select and check the checkbox for Show Develop menu in menu bar option. Close the Preferences dialog window, and a new “Develop” menu will show in the menu bar. Click on Develop on menu bar, and then select User Agent in the pull down menu. A list of commonly used user agents are listed. 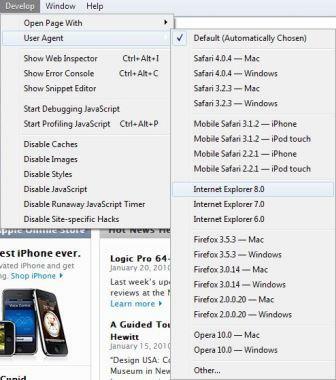 Select any of them if available, or else click on Other to enter custom defined user agent string to use in Safari.